oh my gosh! i saw it on your flickr and freaked out at its cuteness-- so excited to make my own! thank you for the generous free tutorial! Makes me laugh! He's so cute :) love the face and the tail! That is an adorable cat - kudos to you Michelle! So cute! My seven year old daughter just got a sewing machine for her birthday. 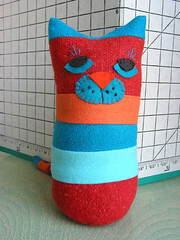 I am going to show her this cat and ask her if she wants to make one. Thanks. oh, thank you... loved this tutorial and I'm thinking of making one!!! I think I'll have to do my first patchwork project soon! Thanks so much for this awesome pattern! I can't wait to try it. that is sooo cute and i love the colors!! What a lovely stripey cat! sooooo cute! I can't wait to try out the pattern :) Thank you for sharing!!! cute doesn't get any cuter than that!! i'll be anxious to give your tute. a try...i'll let you know how it turns out :) and...thanks!! Good job! He is very cute! Thank you so much for the pattern. My daughter and I made on today out of an old jersey scarf! what a wonderful free pattern! thank you!!! How cute!!! Thanks for sharing...I just printed a copy. Stripe-y gorgeous cat.. Can't wait to try the pattern. .
ooooooh I love cats, and this one is extra-cute :-) Thank you for the pattern!! 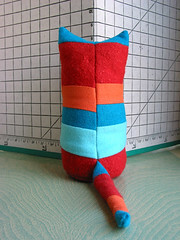 thanks for sharing the pattern for the cat! i made one out of felt, made by my own, and it looks very pretty! sorry, its only in german, but it is the last photo.